Orthodox economics has for long been haunted by the prospect that the growth in foodgrains output in the world economy would not be sufficiently high to sustain the growing population of the world. Orthodox economics has for long been haunted by the prospect that the growth in foodgrains output in the world economy would not be sufficiently high to sustain the growing population of the world. Malthus was an early exponent of this fear. Keynes too subscribed to the view that unless the poor countries somehow ensured that their population growth was controlled, there would be a food shortage in the world economy, of which growing poverty would be a symptom. This view of course was the product of an intellectual ethos which saw poverty as a consequence of excessive breeding, rather than of any social arrangement. This was explicitly stated by Malthus; and classical political economy, influenced by the Malthusian theory of population, advanced the argument that workers’ wages remained tied to a subsistence level because of their propensity to breed rapidly the moment it exceeded subsistence. Marx naturally rejected this position with contempt; he called the Malthusian theory of population, upon which it was based, “a libel on the human race”. Keynes’ case is more curious. Acutely conscious of the flaws of the capitalist system (though striving at the same time to preserve it in a modified form), his main body of intellectual work served to suggest that the plight of the workers under capitalism was pathetic because their employment, and hence earnings, was determined by the whims and caprices of a bunch of speculators. Keynes’ concern about population growth outstripping food supply and hence being the cause of poverty, appears odd in this context. But one must remember that even Keynes, with all his insights into the capitalist system, was remarkably blinkered on the question of imperialism. It never occurred to him to attribute the poverty of the third world to imperialist exploitation; on the contrary he was deeply critical of those who made any such suggestion. As a result, third world poverty, which was there for everyone to see, had to be explained by some cause internal to these societies; and an excessively high rate of population growth was an obvious ‘explanation’. Keynes’ view is echoed by a host of other “mainstream” economists, who, unwilling to even cognise the category of imperialism, let alone any poverty-engendering effect it may have had in the third world, fall back upon explanations internal to these societies for the economic deprivation of their people. And population growth comes in as a handy explanation. But while there is no gainsaying that third world societies must take steps to control their population growth (that is an altogether separate issue), the view that their poverty is because of excessive population growth is palpably absurd. Let us take the simplest index of poverty, viz. nutritional deprivation. 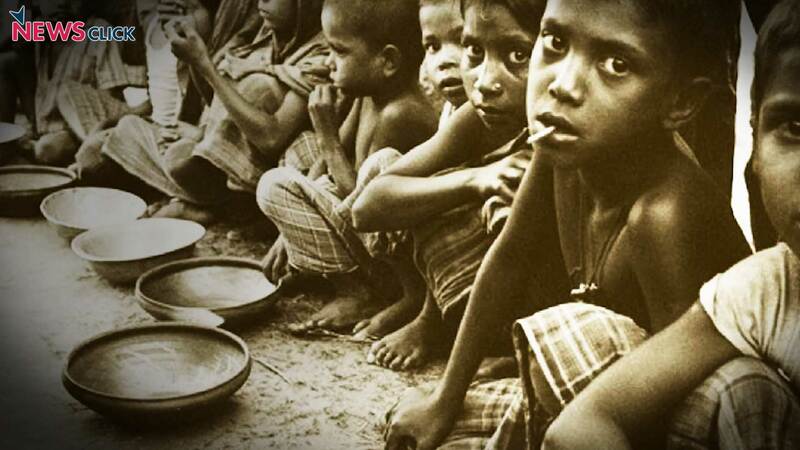 In fact in India, and even elsewhere, the official definition of poverty itself is in terms of nutritional deprivation. In India for instance anyone accessing less than 2100 calories per day in urban areas and less than 2200 calories per day in rural areas is considered “poor”; and these benchmarks have never been repudiated, no matter what subterfuges are employed in actually determining the extent of such poverty. The question is: is poverty so defined a result of inadequate food production relative to population? What is remarkable is that the growth of world foodgrain output has been more or less keeping up with the growth of world population. The average annual world cereal output for the triennium 1979-81 for instance, when divided by the population of the middle year of the triennium, was 355 kilograms. The corresponding figure for the triennium 2015-17 was 350 kilograms. Notwithstanding all dire predictions, foodgrain output has thus more or less kept pace with population over the last three-and-a half decades. At the same time however the amount of cereal stocks relative to output was remarkably high in 2016; in fact it has been rising of late. Notwithstanding the capitalist crisis which has seen a slowing down of world economic growth recently, there has certainly been a positive rate of growth per capita for the 35-year period as a whole. Since the income elasticity of demand for foodgrains including cereals is positive for the world economy, one would expect that, with per capita cereal output remaining more or less unchanged, there would be an excess demand in the cereal market, causing a depletion of cereal stocks. The fact that exactly the opposite has happened suggests that per capita world cereal demand has actually declined even as per capita cereal output has remained more or less unchanged. It should be clarified that we are talking here not of direct cereal consumption but of cereal demand for all uses, including for indirect consumption (via processed foods and animal products which require feedgrains). And statistical evidence, taking pooled cross-section and time-series data for countries, shows that per capita total demand for cereals increases with per capita real income. Hence the fact that this has not happened recently for the world economy indicates that there has been a squeeze on cereal demand through a direct curtailment of the real purchasing power of the working people within countries, who are forced to economise even on cereal consumption because of such a curtailment. (The actual decline in per capita world cereal consumption is even greater than suggested above because a larger proportion of output is diverted for ethanol production now compared to earlier). Contrary to the fears of orthodox economics, the reason for persistent and even growing hunger in the world today arises not from the supply side but from the demand side, not because there is too little output relative to population but because there is too little demand relative to output. Since the magnitude of demand depends upon the magnitude of real purchasing power and its distribution which is socially determined, it is not excessive population but the social arrangement under which we live today, the arrangement of neo-liberal capitalism, that is responsible for the persistent and growing hunger in our world. The proximate cause for nutritional deprivation and hence poverty in the world is our social order not excessive population. To say this does not mean, as already mentioned, that populations should not be controlled. But using excessive population as a camouflage that obscures the role of the social order is entirely wrong and must be rejected. Our argument does not also mean that an increase in per capita foodgrain output should not be attempted. In fact an important reason for the absence of purchasing power in the hands of the working people is the low rate of growth of agricultural, including foodgrain, output. If this growth rate was increased then that would also put larger purchasing power in the hands of those demanding foodgrains, which would reduce nutritional deprivation. But our argument suggests that even if purchasing power was put into their hands in some other way, there would still be a reduction in nutritional poverty without its necessarily causing excess demand in the world foodgrain economy. If for instance cheap or free public healthcare could be provided to the working people of the world then they would get additional purchasing power in their hands which they would use for larger foodgrain consumption, thereby overcoming nutritional poverty. As a matter of fact, the same factor that keeps down the demand for foodgrains also keeps down the output of foodgrains: the gamut of measures through which neo-liberal capitalism curtails purchasing power in the hands of the working people also include measures directed against the peasantry that affect production aversely. Eliminating all subsidies given to agriculture earlier, withdrawing price-support schemes, privatising essential services like education and healthcare that makes them more expensive, which are common features of a neo-liberal agenda, reduce the real profitability of peasant agriculture (ie, profits relative to cost of living), pushing peasants into a vicious cycle of debt, distress, and suicides. Output too is affected adversely as a consequence. The “mainstream” argument advanced by a host of distinguished writers from Malthus to Keynes therefore is wrong for two reasons. First, poverty exists even when there is no shortage of foodgrain output in the world economy, so that the proximate constraint that perpetuates hunger is not on the supply side but on the demand side. Second, even the constraint on increasing output arises not because of any “natural limits” but because of the policies pursued under the regime of neo-liberal capitalism. These two reasons in turn are related: measures that squeeze the demand for foodgrains also squeeze foodgrain output and vice-versa (with the demand squeeze being relatively larger). These measures have to do with the social arrangement rather than any “excessive population”. The fact that “mainstream” writers keep harping on “excessive population” as the cause of poverty, especially in the third world, and turn a blind eye to the havoc caused by the social arrangements, only underscores the deeply ideological nature of economics. Finance capital is always opposed to the use of fiscal measures for stimulating an economy.